We’d love your help. 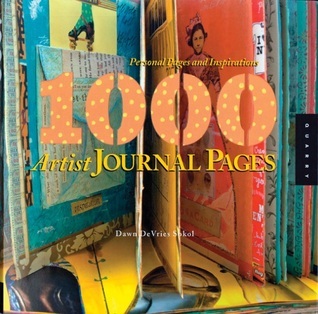 Let us know what’s wrong with this preview of 1,000 Artist Journal Pages by Dawn DeVries Sokol. Over 1,000 journal pages presented in one beautiful full-color bookJournals offer their makers a safe place to dream, doodle, rant, and reinvent themselves. They offer viewers rich, visual inspiration. There is a fascination with these revealing and often beautiful pages of self-exploration and personal expression. Journals offer a tantalizing, voyeuristic view of an inter Over 1,000 journal pages presented in one beautiful full-color bookJournals offer their makers a safe place to dream, doodle, rant, and reinvent themselves. They offer viewers rich, visual inspiration. There is a fascination with these revealing and often beautiful pages of self-exploration and personal expression. Journals offer a tantalizing, voyeuristic view of an interior life. Journaling has seeped into popular culture in a big way and this collection provides a wide array of ideas, techniques and themes to inspire and inform mixed media and journaling enthusiasts. To ask other readers questions about 1,000 Artist Journal Pages, please sign up. Ta-da! It;s one-and-a-half years since I first started reading this book. It has been on my art-supplies table the whole time (it became a sort of coffee-table book). Meagan got me this quirky book--1,000 pages of art-journal pages from different artists. It's a little oversized, half-way between hard and paper back, and in full color. It is a full-immersion book, like walking through an art museum dense with paintings that are so intriguing they swallow you up. I spent a lot of time with this b Ta-da! It;s one-and-a-half years since I first started reading this book. It has been on my art-supplies table the whole time (it became a sort of coffee-table book). Meagan got me this quirky book--1,000 pages of art-journal pages from different artists. It's a little oversized, half-way between hard and paper back, and in full color. It is a full-immersion book, like walking through an art museum dense with paintings that are so intriguing they swallow you up. I spent a lot of time with this book at first, savoring its pages twenty or so at a time, but as I saw I was nearing the end, I had that feeling I often have with a dear book: I don't want to finish it because I don't want this experience to be over! So, it began its long dormancy on the little glass table in my alcove (sounds so much more quaint than it really is). It's a pretty book, so I enjoyed seeing it every day, about as much as I felt uncomfortable with the lack of closure. I never felt like finishing it in all this time. Until today. Sitting in the sun in the alcove after getting anxious over trying to convert to a green, online bill-payer but being in reality an anxious little paper bill-payer (waaah!) I decided it was time (much as you might for example reward yourself with a milkshake after doing your taxes...which I may actually do next weekend now that I think of it). I couldn't remember where I left off, so I started a ways back, then picked a page even further back, then picked a page even further back. It was the same experience as I had had before--total immersion and wonder at each page, then, near the end, revulsion over a few by one artist who has a possibly male name. I couldn't stand to examine them, so I just moved on. 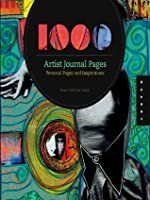 Excellent prompts for new or seasoned art journaler in the beginning, then, literally an art-gallery of artist journal pages from all over the world. Beautifully done with great color quality. Lots of new artists to check out! (um, I have a few pieces in the book too)... But really, I would have bought and loved it just the same! i found this terribly inspirational. It was outstanding to find so much lovely art in one place and to think it came from personal journals. As I paged through it, I made notes of artists and techniques I wanted to try. I was a little disappointed I didn't know any of the artists though. More an experience than a book- I took both pleasure and inspiration from it. I liked this book as an intro to the concept of art journaling-- basically the practice of keeping a visual diary. The journal pages themselves occupy most of the book, and some are stunning. But many are kind of boring, and overall, the text didn't seem to know quite what it wanted to be: a guide to the practice? If so, there is only one page with some half-hearted getting-started suggestions, and that doesn't seem to really cover it. A catalog of journal pages? Well, that certainly occupies th I liked this book as an intro to the concept of art journaling-- basically the practice of keeping a visual diary. The journal pages themselves occupy most of the book, and some are stunning. But many are kind of boring, and overall, the text didn't seem to know quite what it wanted to be: a guide to the practice? If so, there is only one page with some half-hearted getting-started suggestions, and that doesn't seem to really cover it. A catalog of journal pages? Well, that certainly occupies the rest of the book, but the pages themselves are often too small to study, and the information included about each page is sparse at best. A how-to? Only if a how-to can be effectively wordless. Personally I found this book bright colourful and interesting, various styles and techniques from various artists, it gave me quite a few idea for what to do for a sketchbook project during the break between collage and University. Yet I also found the book to become repetitive their were a few stand out pages, but somehow many of the pages seemed to just blend together as if and to be quite frank sometimes I couldn't tell one artist from another. I must confess that this book has been sitting u Personally I found this book bright colourful and interesting, various styles and techniques from various artists, it gave me quite a few idea for what to do for a sketchbook project during the break between collage and University. I must confess that this book has been sitting upon my bookcase for quite some time unopened as now I just find the style quite not to my taste. I think a fine art student or a more abstract illustration student may like this book but overall I found it to be quite interesting just not to interesting. Its all a matter of personal taste. I'm on a roll with creative, artistic books lately, and revisited this one again. It is a collection of journal pages from various artists, and is a good source of inspiration. I loved this book the first time I read it many years ago, but this time around, found that I merely liked it. Fun, and colorful, but not what I need anymore I guess. Maybe because there is so much available on the web today. Another compendium of artist's sketches from the US and Europe. It only notes the artist and country and it would have been nice to have had more info, but then the book would have been cumbersome to handle. Another book to sit and gaze at in wonder...many hours are required to fully appreciate the work. This book is full of beautiful and interesting journal entries. I find it most useful to open up to pages randomly when struggling with writing and journaling and seeing what happens from there. A friend let me borrow it, so unfortunately I have to give it back to her, but I have a feeling I will be purchasing / coming back to it sometime in the near future. This was the book that finally fed my obsession with art journals. A wonderful collection of creative efforts from artists with different style and approaches. It made the idea accessible instead of something I wanted to try someday. Beautiful book. Pictures were entirely too small on an ebook. This presentation did not give each artists work a fair way of being seen. It became relentlessly boring after ten pages. perusing actually. it's a visual rather than a literary experience. i loved looking through this & will likely get my own copy. it is really inspiring to look at the personal, graphical ramblings of other creative minds. it has inspired me to take up journaling again & use it in a new way. This is like Sabrina Ward Harrison's book 'Spilling Open', but add hundreds more artists to it and hundreds more pages. Awesome inspiration for journal keepers. An excellent collection of inspiration. Plus there's artist contact info in the back for every one of the artists! Totally eye-candy and so inspiring! I was really hoping this would kick start me into to keeping a journal again. Did not. Yet another book I saw at the bookstore which fascinated me... I'm currently charged with the desire to be creative.